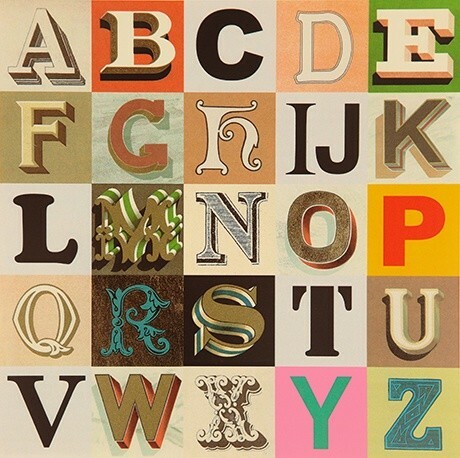 This exhibition by Sir Peter Blake comprises three print series, Alphabet (1991), An Alphabet (2007) and Appropriated Alphabets (2013), and a personally chosen selection of related original artworks. Throughout his long and prestigious career Blake has created several series of works based around the alphabet related to his enduring interest in childhood innocence and nostalgia, and Victorian and Edwardian graphic illustration. Using vintage cards, magazines, books and other found ephemera, he assembles collages that are at once whimsical, humorous and fascinating. He began using found letters and commercial lettering in the 1950s and, as a young artist, allied himself with decorators, sign painters and commercial artists.